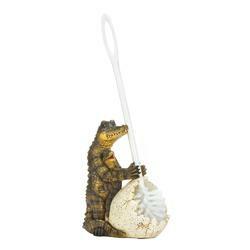 This crocodile and her baby are standing by to help keep your bathroom sparkling clean. Made from polyresin and painted with beautiful detail, this fun toilet brush holder features the two crocodiles and a broken egg that holds a standard toilet brush. Weight 1.6 pounds. Dimensions 7.5" x 4.5" x 9.5". Polyresin. UPC Number: 849179028930.